Three world-class trumpeters from different parts of the Jazz Galaxy converge on Minneapolis on the same night, February 12th. Each appears at a top-notch venue. It’s almost embarrassing—are we trying to compete with New York? Actually two world-class trumpeters are on the same gig as part of MacPhail’s Jazz Thursdays series of performances in Antonello Hall. Ron Miles, Denver-based but internationally acclaimed, will be the guest composer/performer with the Jazz Is Now! Nownet, Jeremy Walker’s composers’ ensemble. 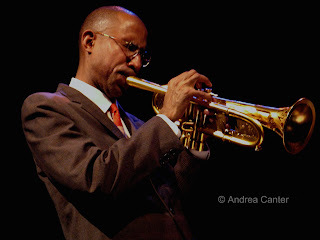 Miles has particularly gained a reputation for composition and artistry through his associations with Bill Frisell and Matt Wilson, with whom he performed at the Dakota in 2006. He’ll be conducting a Master Class at MacPhail the night before, February 11th. Jazz Is Now also includes our locally-based trumpet master, Kelly Rossum. If you love modern trumpet jazz, you can’t miss at MacPhail. If your tastes run more traditional, you can’t miss with the Minneapolis Mardi Gras at Orchestra Hall, led by New Orleans trumpeter and new Artistic Director for Jazz, Irvin Mayfield and the New Orleans Jazz Orchestra All-Stars. There’s more fun afoot with soul princess Irma Thomas and the Rebirth Brass Band on the program. This is the first of three opportunities to hear Mayfield at Orchestra Hall this year—so if you miss it to attend one of the other options, you will get another chance to hear his celebrations of Crescent City music. Finally, if you are truly into genre-defying, boundary bending music, the Walker Art Center hosts veteran sound experimenter John Hassell and his assemblage of electronics and strings, energizing the trumpet in odd ways that yield some of the most majestic ambient sounds you can imagine short of space travel. Before we get to Thursday, there are a few cool things in jazz this weekend and early into next week. The Atlantis Quartet returns to the Artists Quarter (Friday night) after a big crowd welcomed their debut there last month. Saturday night features three musicians who need no introduction---Tanner Taylor on piano, Billy Peterson on bass, Kenny Horst on drums. They just might swing themselves up the stairs and down the mall....if you see smoke, you’re in the right place. Or if you want to stay west of the river, Debbie Duncan and former Twin Cities resident, Adi Yeshaya, reunite for a smoldering Saturday night at the Dakota. I will have to load up on caffeine this weekend because Late Night at the Dakota offers back to back sizzlers---The Rossum Electric Company (Kelly Rossum’s high tech electric band) on Friday and the Atlantis Quartet on Saturday. Ignition at 11:30 pm, acceleration til 2 am! The Twin Cities Jazz Society celebrates 30 years of support and appreciation for our local jazz community, and the party is at the Dakota Sunday night, 5-9 pm. Of course the main event is music throughout the evening, with Mary Louise Knutson and a hot quartet (Graydon Peterson, Jay Epstein and Doug Haining) supporting the likes of Dave Karr, Irv Williams, Kelly Rossum, and a slew of the best voices in town. Lots of fun and the proceeds will support TCJS programs. Speaking of fun, there is no better time to be had than a night with Ann Hampton Callaway. Her engaging banter and clever creations of songs in the moment might divert attention from the fact that she has one of the best voices, and highest interpretative powers, on the vocal jazz scene. Her new release, At Last, kills from start to finish as a cohesive tale of the elusiveness and ultimate power of love. She’s at the Dakota Monday and Tuesday. More songs without the big cover charge are in the air this week—Nancy Harms Friday night at the Dakota County Steakhouse, Maud Hixson during Sunday brunch at the Times, Rhonda Laurie for a early Valentine’s Day evening on Wednesday at Cave Vin. 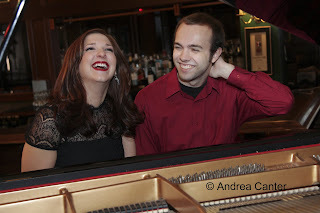 Also on Wednesday, there’s a special CD release celebration at the Artists Quarter for Rachel Holder and Dan Musselman’s Save Your Love for Me, a truly bold and exciting voice/piano duet set. And if you are into vocal jazz, the acclaimed Anita O'Day film is back in the metro, showing at Carmike Theaters in Moundsview and Apple Valley this weekend only! I missed the showing at the Lagoon and plan to head out to Apple Valley Saturday afternoon. Shows at 1:30 and 7:30 pm. On the horizon—JzzMN Big Band with Nicholas Payton and The Hornheads (Feb 14), Valentine’s Day with Carole Martin at the AQ, Sophie Millman at the Dakota (Feb 16-17), Gary Berg’s 70th birthday party at the AQ (Feb 18). Photos: (top) Ron Miles at the Dakota with Matt Wilson's Arts and Crafts in 2006; Rachel Holder and Dan Musselman prepare to release Save Your Love for Me. Photos by Andrea Canter.